Our intrepid Squirrel is resting up in anticipation of his flight on the morning of Dec 7th, 2018. He is ready to go! Here is this morning’s prediction generated by the CUSF Landing Predictor. I am keenly watching the weather forecasts for Friday the 7th. A storm front is predicted to pass through Southern California on Wed & Thursday. Five days out, the weather predictions start to become more reliable here in California. So far it looks like the rain will be gone before launch day. It is less certain is what the wind conditions will be. Out in the Mojave Desert, following a passing storm front, ground winds can kick up and that can make launching a challenge. Let’s keep our fingers crossed for calm winds on the surface! 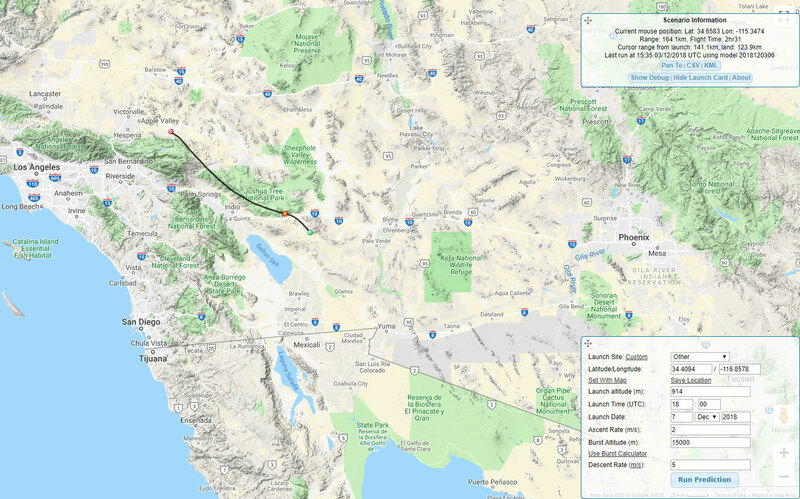 I started running balloon flight simulations over this past weekend and as usual the predicted direction of the balloon has shifted around a bit each day, but generally speaking the predicted direction is to the south west. This is a favorable direction because of the wide-open areas which favors recovery, unless we happen to land on a mountain top or the Salton Sea. This time of year, it will be cool in the desert. Potentially COLD. All of us will need our warm jackets. The Squirrel will be sporting a pink fiberglass insulated jacket to keep him warm even at high altitudes. The ascent rate and burst altitude inputs are still somewhat wild estimates. FS#2 did not ascend quickly or very high and I had hoped it would provide useful data for these numbers. Now it is up to FS#3 to get this data. I will follow up with new predictions each day though launch day. In short, so far so good for our Squirrel.